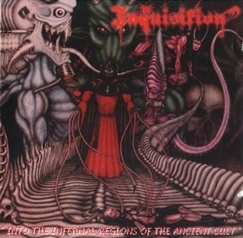 Released in 1998, Inquisition's debut full-length Into the Infernal Regions of the Ancient Cult has to have been a joke. This is clearly a parody of Black Metal, yet most listeners don't seem to be clever enough to recognize it. Everything about this, from the ridiculous titles to the generic songwriting to the obvious mockery of the vocals... this cannot be serious. But then how is it that the band still exists? In the seventeen years since the release of this spoof album, Inquisition has gone on to record five additional records. Somehow, they have managed to amass a decent following (at least in the states), through this continued charade. The most severe problem regarding this recording has to be the vocals. It is inconceivable that anyone would possibly take this seriously. Of course, there have been many rather polarizing vocalists over the years, from Dave Mustaine and King Diamond to Varg Vikernes and Rainer Landfermann. But this goes beyond either a poor voice or an over-the-top style; what Dagon does is the single most absurd thing I have heard. He sounds like someone that has been suffering from throat cancer and needs an artificial voice box to speak. For the most part, that is precisely what he does: speaks. Very rarely are any actual Black Metal vocals used. Musically, Into the Infernal Regions of the Ancient Cult, does not offer anything so good as to suffer through its shortcomings. The drums are too high and clear in the mix, with the guitars relegated to the background. The clarity of the production does the band no favours, as well. The percussion seems to be the driving force behind the songs, rather than the riffs, with a lot of random tempo changes that do nothing to help create any sort of atmosphere. The riffs are generic and indistinguishable. One can detect influences from the likes of Celtic Frost and Immortal, such as in "Those of the Night", but it is not pulled off very well. Speaking of which, one gets the impression that some of the song titles are a direct mimicry of the latter. The slower sections with the open arpeggio riffs are the most enjoyable parts, but they just come along indiscriminately and soon give way to ideas that come across as disjointed. There are even strange folkish elements shoehorned in, feeling awkward and forced. While there was much worse being passed off as Black Metal around 1998, Inquisition did nothing here that bands like Horna and Maniac Butcher weren't already doing much better at the very same time. Sometimes, one can judge a book by its cover. In this case, the cover of Into the Infernal Regions of the Ancient Cult features artwork clearly done by a retarded fifth-grader. That sort of captures the overall feeling of the album, thanks to the idiotic vocals, sup-par songwriting and tedious running time. Generic Black, Death and Thrash Metal are here combined in a haphazard manner to create a pathetic example of modern 'extreme metal'. That this band is still going and releasing albums today can only be a testament to the fact that most idiots will buy anything if they're told how evil and cult it is, regardless of its low quality. Dagon and his cohorts are either charlatans or comedians. Either way, avoid this farce.